Olly the Activist Dog lives in Townsville, North Queensland, Australia and while out on daily walks wears a lightweight corflute sign about a current issue. During the walks along a popular 3km strip of beachfront called The Strand, Olly comes into contact with up to 1,000 people. In October 2012, as a way to engage people around current issues, I put a lightweight corflute sign on Olly's coat with a message about a current issue. The sign with a direct and clear message and Olly's outgoing manner engages the public with the issue. Leaflets are distributed, signatures on petitions obtained and many spontaneous photographs captured with Olly and the people she meets on her walks. The photographs are then posted on Olly's Facebook Page - https://www.facebook.com/ollytheactivistdog, shared via twitter - @ollyactivistdog and sent to relevant politicians, decision makers and media. Olly campaigns on a wide range of issues, with the ongoing campaigns being: Stop Live Export, No Uranium Mining, Save the Great Barrier Reef from Coal, Respect Refugees, Ban Puppy Mills, and Choose Cruelty Free. As well, Olly attends specific events when invited, such as the Uranium Rally in Townsville, Save Stuart School, and attends monthly Refugee Vigils outside of the local Federal MPs office. ATAAC | Australian Teens Against Animal Cruelty We're lovin' Olly the activist dog for getting the word out about animal injustices! 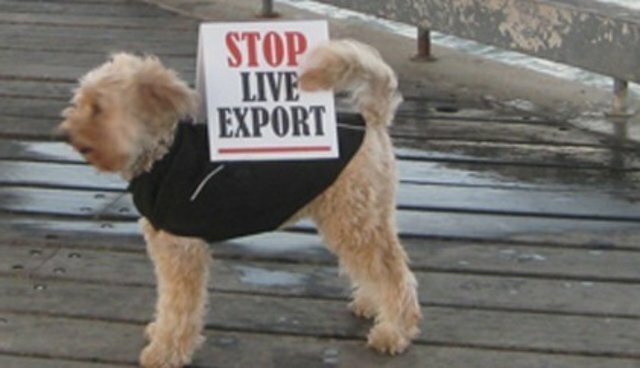 Greenpeace Australia Pacific commented on Olly the Activist Dog's photo. "Haha we love you Olly!!!!" Larissa Waters - Australian Greens Senator for Queensland You are one of my favourite four-legged constituents. Hope to see you when I'm next in Townsville! Amnesty International Australia ... ... Olly the activist dog has started a one dog campaign to restore the balance.